This Roma's Hospitality Centre marriage had all the elements of a phenomenal wedding reception. Laughters, tears, interactive games, outstanding dancers and more. This album spread captures three of the most important moments of the evening. The image on the left showcases the bride's parents giving a speech during dinner. While the father was addressing the audience, the mother of the bride hugged him and placed her head on his shoulder. It is a very touching moment that I had the pleasure to capture. The second image shows the brides three sisters giving their speech. Their wearing golden dresses and we can see one of the bridesmaids looking attentively at them. Finally, the last image on the spread shows an emotional bride reacting to the speeches. She is shedding a few tears in the groom, with his eyes also watering is kissing her hand in a beautiful gesture I was lucky to immortalize. While speeches are not the most favourite part of the wedding for many photographers, I love them. They often give me opportunities to capture timeless photographs and emotions that the married couple will remember many decades down the road. 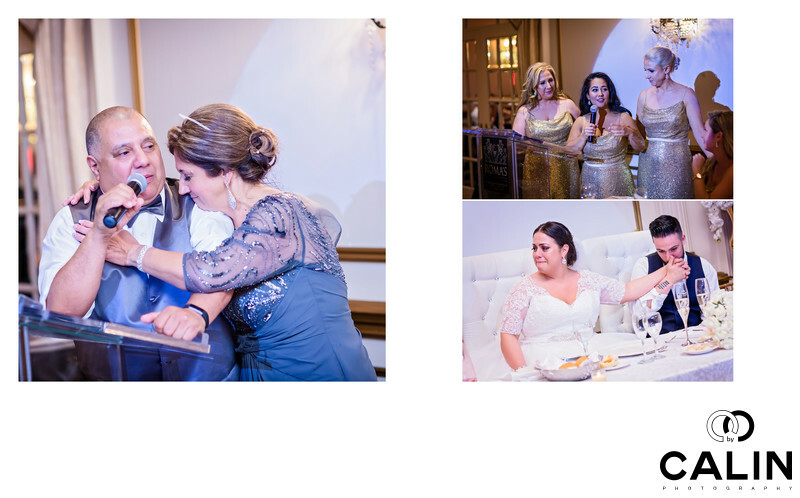 As a Toronto wedding photographer, it is my duty not only to create artworks for the couples but also to document the most important moments of the day. As such, I consider the speeches, along the family group photographs among the most important parts of the day. Wedding photography is not only about creating the epic shots, but also about documenting the presence of the family members and guests who might not be around forever.